Caolán was lucky enough to win his future bride Gillian in a game of poker in Australia (;)) and they travelled home to get married in her native Ballingarry. Their wedding was a great day – a relaxed family day out with a bit of welcome Australian sunshine. Plenty people chipped in to help out too – with Heather helping out with the planning and Gillian’s mother’s friend Ginny doing an amazing job with the flowers. Getting the last few jobs done – ironing ribbon, writing a speech and practising walking up the aisle. The gardens in the Mustard Seed. We were only there for twenty minutes but I could have spent hours there. Caolán getting completely destroyed with lipstick on the very first kissing photo. That was the end of the kissing! The outdoor reception in the sunshine at the Bunratty Castle Hotel. 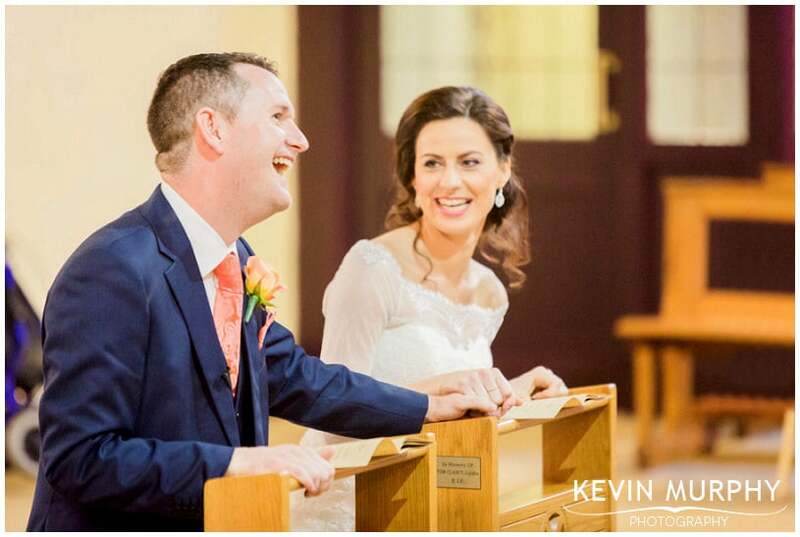 The best man, Tiernan’s speech – a poem with some hilarious killer punchlines. Maria and Sean travelled home from New Zealand to get married in Ballycorick church. It was an emotional and romantic day – from Sean’s letter to Maria in the morning all the way through to that dip during the first dance! It was also a lot of fun – with both Maria and Sean beaming all day long – even when they decided to go out in the rain (and the dark) to get a photograph with Bunratty Castle in the background. Legends! Maria’s “something blue” shoes and heirloom wedding ring. Ben making Fiona smile for the camera. A sneaky pint in Durty Nellies. Their fresh cream wedding cake. How delicious does it look? The New Zealand gang hakka. It was such a pleasure to deal with you from the first email right through to the spectacular slideshow you put together for after our meal. The photos are incredible from what we’ve seen so far also. Kudos for remembering our Pinterest ideas too… ALL OF THEM . You’re a credit to yourself. 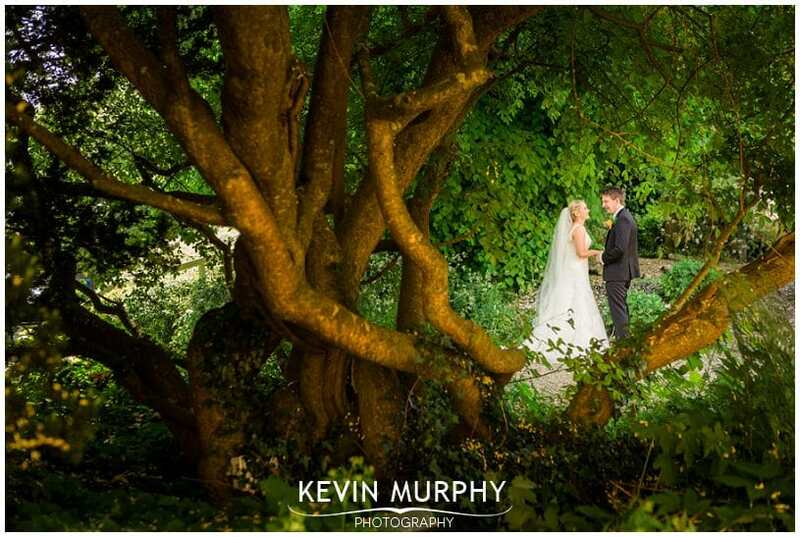 Aisling and Brian were married in Cratloe church and held their reception in the Bunratty Castle Hotel. From the very first meeting, I knew this wedding was going to be a good one. Aisling loves Christmas so that set the tone for the planning – and it ended up being the Christmassiest of Christmas weddings! 😉 From being walked up the aisle by Santa Claus himself, through to having snow during the photographs and even picking up an elf along the way! Hanging out with the girls as they got ready in Altamoda – I loved the unusual hair styles and headpieces. Morgan – what a star. Carrots for Rudolf at the door of the church. Being walked up the aisle by Santa Claus himself! The most emotional reflection I’ve ever heard. There wasn’t a dry eye in the church. Going to the folk park with the bridal party was so much fun. It was in full festive mode which fitted the wedding theme perfectly and Aisling and Brian were like celebrities (or princesses) to the children there who randomly gave them high fives and waves as they passed. AND we got snow! Perfect! Aisling leaving her wedding bouquet on her mother’s grave. Santa showing up every time anyone turned their back – when they rang the bell for the meal I heard someone saying “here comes Santa again”! The “Aherne Team” entrance music. Where do we start?!! Thank you so much for all your help and advice in making our wedding day so special! From the moment we met you, we knew that you would be a pleasure to deal with. Even though we were expecting a professional and courteous service, you met our high expectations and exceeded them. We cannot thank you enough. 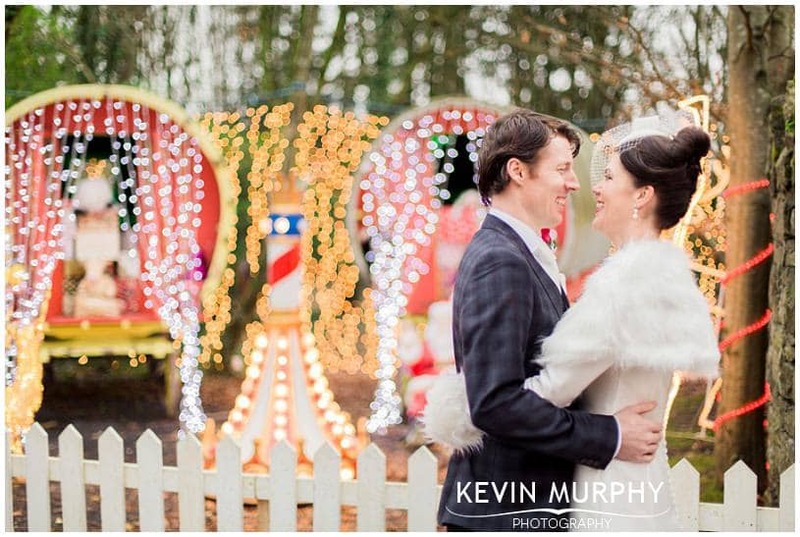 I still cannot believe the magical moments you captured for us in the Folk Park. I knew it would be a special place, but my gosh, you had everything researched and your attention to detail and creative eye will make for the most fabulous images and memories we will cherish in the years to come. We were so thrilled with the slide show, which was one of the highlights of the reception. We are so delighted to have met you and had you to capture what was the best day of our lives. Emily and Bernard were married in The Wells Church and held their reception just over the road in the Bunratty Castle Hotel. The day got off to an early start with Bernard and his groomsmen going to Calvin Arthurs Barbers in Shannon for hot towel shaves. Meanwhile the girls were getting ready at home with Val O’Dea and Rachelle Guiry looking after hair and makeup. During the hot towel shave, your face is completely covered with a hot towel with only your nose left free for breathing. I’d imagine it’s pretty relaxing. But NOT when somebody decides to give you a “wet willie” (if you don’t know what that is, the dictionary definition is “The act of moistening one’s finger with one’s own saliva, and inserting said finger into another’s ear canal”!). I’m not going to name and shame the culprit, but the list of suspects is pretty short! Emily and Bernard are two of the nicest, friendliest people you could meet – they are well matched! It was a shame the weather was so rainy on their day – a far cry from their engagement in Sicily, that’s for sure. Luckily, we got a break in the weather for a few minutes so we managed to get outside for some photographs on the grounds of the hotel. Phew! The craic at Calvin Arthurs. It was a really nice chilled out start to the day. Oscar the dog! He’s probably still recovering from all the excitement! Emily’s relationship with her parents, there were so many tender moments – and that was before we even left the house. Even though it was raining, there was something nice about people sharing umbrellas, gentlemen offering their jackets and people huddled in the shelter chatting. How happy Emily and Bernard were during the ceremony – when I was looking back over all the photographs from the day I realised I was smiling to myself. The flowers – from the bouquet to the cherry blossom tree table plan to sprigs of lavender on the table settings. The singing waiter Emily had organised as a surprise for Bernard. It went down a treat! Gerard’s speech, which had the best closing line I’ve ever heard! 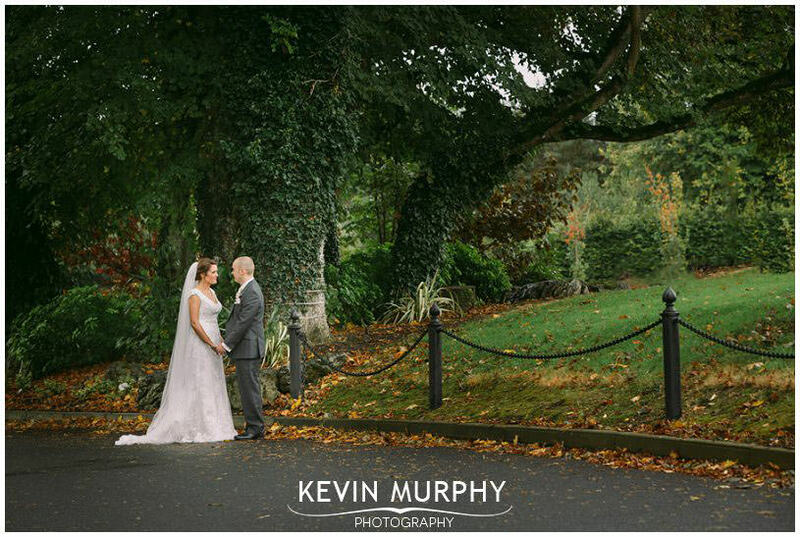 Gemma and Colin were married in Monaleen church and held their reception in the Bunratty Castle Hotel. Colin is a bit of a romantic and swept Gemma off her feet by taking her to the Hurlers Bar on their first date! 😉 They are a sweet couple and their wedding had a sweet theme, with a sweet table, sweets on their cake and sweet centrepieces. If there was an award for being laid back, these two would be world champs! I don’t think anything would faze them. Gemma is very close to her grandparents and it was lovely to see her grandmother helping her get into her wedding dress. One guest, just for the fun of it, dressed up as John Travolta from Grease! It was based around a surprise guest appearance from the man himself at Gemma’s hen party. 😉 A few jaws dropped when he first appeared, but Gemma just smiled and said “I love it”! Both Gemma’s step dad and her grandfather walked her up the aisle, swapping half way. Mons. Dan’s comment that their mothers were like twins! Clive, Best Man Extraordinaire, who doesn’t drink but went along with it when I got all the groomsmen to make use of their hip flasks – sorry again! Colin’s speech which was equally touching and very funny.